Greetings and salutations to my cherished programmers! It’s Andy Gesner and the staff from HIP Video Promo coming at you with another visual treat. It’s been a great year for punk rock, and we owe so much of it to our friends at Fat Wreck Chords. We expect only the best from Fat Mike and his team, so it isn’t like we’re surprised, but it wouldn’t be fair not to say it: the veteran punk label has been on a winning streak to put the Yanks and Mets to shame. Fat Wreck Chords bands have been everywhere this summer – the Warped Tour, MTV, talk shows, soundtracks, you name it. The California-based company has always been tops at scouting talent, and now they’ve outdone themselves, adding the fiery Strike Anywhere, one of the East Coast’s best-regarded punk bands, to their already star-studded roster. Their debut for Fat Wreck Chords, Dead FM, will be released early this September. The only thing that’s changed for Strike Anywhere is the label on the album. Brian “The Man” McTernan (Thrice, Moments In Grace, The Loved Ones, too many others to list) is back in the producer’s chair, and he continues to capture performances that would make any O.G. purist nod his head in approval, and any radio-listening punk kid raise his fist in solidarity. The Richmond, VA quintet has never sounded better: tight, fierce, tuneful, direct, and sandpaper-rough. Those who admire Strike Anywhere for their progressive politics and egalitarian message (this is a group that uses an anti-fascist symbol as their logo) will find the arguments on Dead FM cut deep, and that the anthems are positively inspirational. And for those who just like to rock; well, this is a band that has contributed music to the last two Tony Hawk skateboarding Playstation soundtracks. It’s safe to say that listening to Strike Anywhere is a kinetic experience. 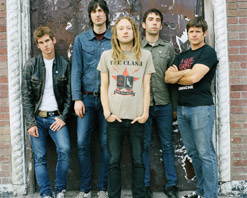 Their incendiary stint on the ’05 Warped Tour is now a thing of indie-punk legend, and has been chronicled in the documentary Wake Up Screaming. The quintet continues to crisscross the country, playing wildly energetic shows almost every night to devoted fans across America. They may Rock Against Bush, but armchair radicals they are not: they take their message straight to their fans. That rapport with fans and listeners is apparent to anybody who has been at a Strike Anywhere concert, and in the celebratory performance clip for “Instinct”, it’s placed front and center. Fans of the band are shown pinching batteries: from convenience stores, parents’ pockets, old useless devices. They’re headed to a Strike Anywhere show, one held under lights powered by a generator (which, in itself, is a metaphor for D.I.Y. activity). When the gasoline runs out and the room goes dark, both band and fans continue rocking undaunted – scores of flashlights, run on purloined batteries, switch on, and the room comes alive with dancing beams cast from the floor to the stage. The band is literally made visible by the will of the people it strives to reach. Here at HIP, we are incredibly psyched to be working once again with Brian Archer and all of our friends at Fat Wreck. Strike Anywhere will be on tour for all of September and October, so definitely be in touch to set up video interviews when they come through your area. We’ve also got enough copies of their brand new CD Dead FM on hand for all of your on-air giveaway needs. If you need more info call Andy Gesner at 732-613-1779, or email HIPVideo@aol.com. You can also visit www.FatWreck.com or www.StrikeAnywhere.org to find out more about Strike Anywhere.